Ich habe die heimliche Migration der Steine gesehen. aber wer bleibt, wird bald eine Ruine sein. ein hochgetürmter Stapel, ein langer Schatten. als könnten sie das jeden Moment auch mit dem Körper tun. aber das, worauf wir hoffen, ist noch nicht geschlüpft. wie sie kommen, in unser Blickfeld taumeln. es ist die Erde, die sich löst, zu rollen beginnt. Sie drängeln nach vorne, eine Leere entsteht. LÜ De'an (*1960) was born in a small town of Fujian province, southeast coast of China. He quit high school and later went to an art school to learn painting. He began to write poetry in 1978. He lived in New York City from 1991 to 1994 as an artist and returned to China in 1995 to built a cabin in the mountain area of his hometown where he has continued to write and paint. 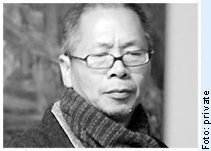 He has been a highly acclaimed poet in China since the 80s but has kept a low key for almost three decades and avoided the poetry debates or showcases until appointed as poetry editor of the ImpactChina website in 2011. One interesting story about him was that when Yu Jian gave his first USA reading in Boston in 2004, he (LÜ De'an) was rejected at the door and later he made an understated remark: Yu Jian was inside reading and visited Seamus Heaney upstairs (at Harvard), I was outside waiting because they didn’t allow me to enter. He was published together with Yu Jian and Han Dong in their unofficial but influential magazine “They” in the 80-90s, the other two became famous while he’s been hardly noticed until his third collection of poetry came out in 2010. Time Magazine in China hailed him as Chinese Robert Frost. Poets and critics in China today praise him highly for his solid craftsmanship.